With only $10 For a Domain Name, You Can Install WordPress on Free OpenShift with Domain Name For Running Personal Blog or a Specific Purpose Website. Cost is Zero for Hosting. We can use 3 Gears – one for web server, one for memcache or syncing with web server and another for database – scalable setup, each of 1 GB. If you use Rackspace Cloud Files as CDN, monthly cost will be only $1.00. It is far better than your shared hosting options. You have no IP address, this guide not without reason is named Install WordPress on Free OpenShift with Domain Name. When you create the first application, you actually get this kind of url – https://shell-abhishekghosh.rhcloud.com. How to use that is written on this guide. Yes, you can change the URLs later, but the sequence is important. If you first create a plain PHP App, you will actually get the subdomain name. Later you can install WordPress after pointing the CNAME towards it. Add the CloudFlare’s name-servers at your domain register’s account. Then on CloudFlare’s Page Rules, add 301 redirect to example.com towards www.example.com with redirect match. Allow some time, things will start working. Now, from OpenShift’s account; first re-create the installation as WordPress with scalable option – MySQL database will be on different server. You can have PHPMyAdmin. No command line work. You can make it more scalable later. What we said is easy, official method. As there is by no means you are installing the WordPress; it is readymade; you need to do some tricks. First, login to WordPress and go to : Settings > General and change the Site Address (URL) to your domain name (http://www.example.com). Also change the WordPress Address (URL) in the same way. Now, keep that webpage open. Go to OpenShift dashboard and select your app then click the “Change” button next to the domain name and update the OpenShift domain name (shell-abhishekghosh.rhcloud.com for us) to your own domain (http://www.example.com in example). Then save it. Now, your WordPress is located at http://www.example.com. There is a Plugin named Search and Replace. Install it from WordPress Plugin’s page and search for the OpenShift domain name (shell-abhishekghosh.rhcloud.com for us) and change anything to your own domain (http://www.example.com in example). shell is the app name of shell-abhishekghosh.rhcloud.com, change it. git push it. There are plugins to edit .htaccess files. Install some such via WordPress interface and activate pretty permalink. Add the things which are not present. This is the complete setup. Obviously, there will minute glitches but it is far superior than anything at that budget. Heroic is great but Heroku can be difficult to many users. This Article Has Been Shared 801 Times! 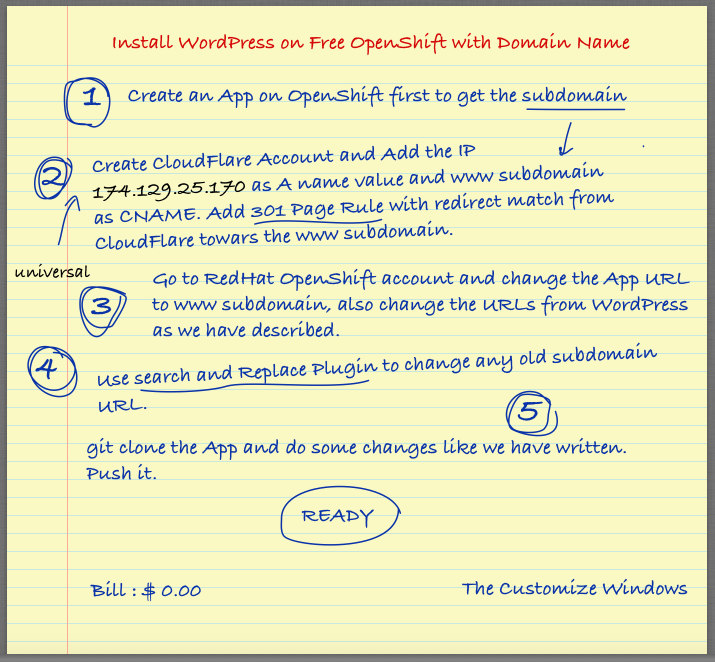 Cite this article as: Abhishek Ghosh, "Install WordPress on Free OpenShift with Domain Name," in The Customize Windows, May 5, 2015, April 23, 2019, https://thecustomizewindows.com/2015/05/install-wordpress-on-openshift-with-domain-name/.